Thank you to all the readers who have bought, read and enjoyed my books. If you have the time and the inclination, it would be awesome if you could leave a review on Amazon or Goodreads, and if not, feel free to just send me a message to let me know what you thought as I love to hear from my readers. Cheers! Shadows of the Realm is the first in The Circle of Talia series and A Time of Darkness the second (with the third book due out in February 2014). Would I say it’s the best fantasy series with dragons you’ll read this year? Possibly. 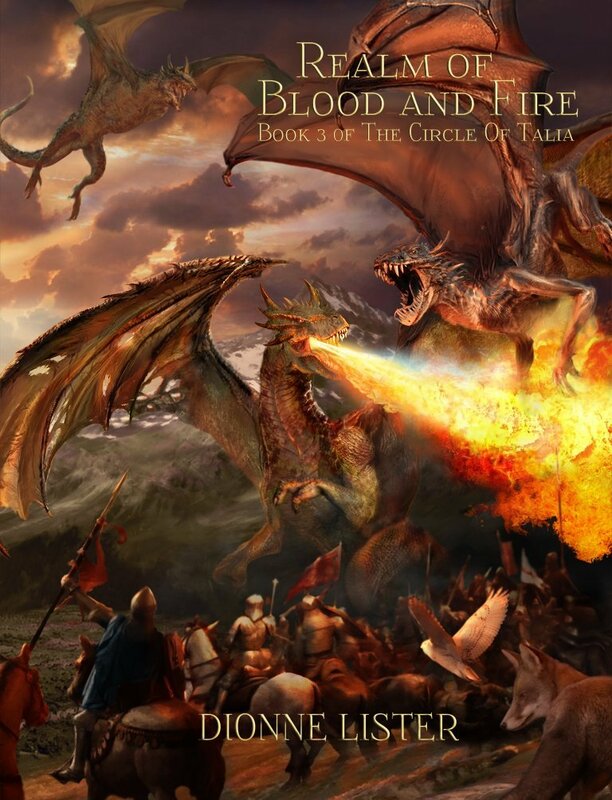 If you love action, suspense and dragons, you will probably enjoy this. They’ve both had many awesome reviews on Goodreads and Amazon. So, if you’re looking for a new fantasy book or fantasy series to invest in, try this (the dragons implore you). What is Shadows of the Realm About? With their world under threat of invasion, Bronwyn and Blayke, two young realmists, are forced to leave all they’ve known to undertake a dangerous journey to learn the magic of the realms before everything they love is destroyed. If you’d love a real, paper version visit Amazon US or Creatspace for those in the UK. The prose is extremely well written, and I found the book handles the shifting between the many characters’ storylines and locations quite well – it was effortless to keep up with them—Anna K.
In the final, exciting instalment, the gormons are close to taking Talia for their own. While the realmists watch, powerless to intervene, the gormons lay waste to Talia, city by city, moving closer to Vellonia each day. As the final battle nears, The Circle can’t meet the conditions of the prophecy, and hope is dwindling. Can Bronwyn and Blayke do what they must — destroy those they love to save their world? Tens of thousands will die and everything will come down to one final, split-second decision. Will it be the right one? I want the second book. It is an interesting beginning. I enjoy it very much I would like to read more. I have to say it is a book I would have a hard time putting it down if I was to read it all. Thanks Phyrak. If I’m lucky you might buy it ;). Is there a third book? Surely you are not leaving readers like myself hanging!! I would not have started reading them if I had known it wasn’t finished. I’m sorry Jackie. It is true that I am cruel. The third book will be out in February 2014. I’m glad you’re enjoying the series though :). I have to say, I never enjoyed reading books and decided on a long road trip yesterday that I would start investing some time into a more.. productive hobby. I was browsing the books on my iPhone and decided I would try this one out. I had a real hard time putting it down and just finished it, purchasing the second one shortly after I finished. I don’t know how I’m going to wait until Feb2014 for the third!! Thank you so much, Heather! It was lovely of you to buy my book but to take the time to let me know that you enjoyed it was super wonderful! Sorry you have to wait :). I cannot wait for the third book! Thanks, Susan. I’m so happy to hear that! Yay on the release of the third book! I may have to re-read the second one to catch up. I had to do that with the Wheel of Time series – every year lol. At least this will be the final book in the series :). No more cliffhangers ;).